Disposal of household toxics and electronic waste is available free to residents of participating jurisdictions. The facility in Poway is located at 12325 Crosthwaite Circle, off Stowe Drive, east of Community Road in the South Poway Business Park. It is open every Saturday from 9:00 a.m. to 3:00 p.m. (the facility is closed on Sundays, weekdays and holiday weekends, see the holiday schedule). Proof of residency (formal I.D. or current utility bill) is required. No appointment is necessary - first come first served. The facility in Vista is located at 1145 E. Taylor Street, across the street from the Public Works Department. It is open every Saturday from 9:00 a.m. to 3:00 p.m. (the facility is closed on Sundays, weekdays and holiday weekends, see the holiday schedule). Proof of residency (formal I.D. or current utility bill) is required. No appointment is necessary - first come first served. From State Route 78, exit Civic Center Drive, go north. Turn right on East Vista Way. Turn right on Arcadia. Turn left on Laguna Lane. Follow Laguna Lane to East Taylor Street, turn left onto East Taylor Street. Facility (and the entrance) are on the left. 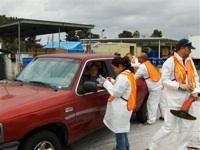 Stericycle Environmental Solutions 858-481-SAFE (7233) for general information and closed Saturday schedule. The facility in Escondido is located at 1044 West Washington Avenue in Escondido. This facility is open on an appointment-only basis, two Saturdays per month. Please call (760) 745-3203 between 8am and 5pm, Monday – Friday to find out the available dates and schedule an appointment. The Escondido Facility is for Escondido residents as well as RSWA Member Agency residents, but not the contract member residents. Free door-to-door collection services are available to citizens 65 or older, or households possessing a registered handicap placard. Door-to-door program is available to all others for a $10.00 copay. The City of San Marcos provides this program for only homebound and seniors. The City of Carlsbad charges a $10 co-pay for everyone utilizing this program. Please contact Stericycle Environmental Solutions at 858-481-SAFE (7233) to schedule an appointment. 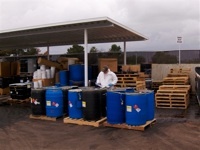 To reduce the amount of Household Hazardous Waste you generate, please buy only what you need and use it entirely. Choose less toxic alternatives and recyclables.